Essaouira, 모로코의 리아드 레미 | 호스텔월드에서 예약하세요. 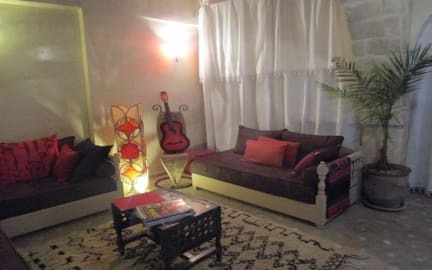 The Riad Remmy is located in a residential area of the Medina away from the hustle and bustle of the busy main streets. We have a well-stocked library as well as an iPod for general use. Sandra, the house manager, lives on-site and is a mine of local information. She is also available to assist, advise and make recommendations to the guests on all matters including reservations, transfers and day tours. We are in a quiet location. We are only a short walk away from the beach, Main Square and the port. The Riad has free Wi-Fi. The ground floor consists of two lounge areas and kitchen/dining area. The first floor has two double rooms and one single bedroom. The second floor has a double bedroom and twin bedroom together with a self-contained kitchen and lounge/living space. The house is decorated in a clean and tasteful manner with Moroccan lights and decor. We have a lovely roof terrace which has sun loungers, tables and chairs. The plants in the house and on the terrace are well maintained and we have two tortoises who roam around freely on the terrace. On arrival to Essaouira, all our guests are met by Sandra who walks them to the Riad. Once there they are offered refreshments, given a map on which all her recommendations are indicated and, if required she will give them a short tour of the medina. We are located in between the gates of Bab Marrakech and Bab Doukala and only a few minutes’ walk away from the beach and the main square. As we are situated in the residential part of the medina we are only a short distance away from the local tailors and dressmakers who you will see making the local traditional clothing. Also on our doorstep you will see the local bread makers (from where we buy our freshly baked bread) and Hammams which are the local bath houses and are open to the public. All our rooms are ensuite with a shower and have hanging space and drawers for clothing. All the furniture in the house is hand-made by local craftsmen. Two of the double rooms have 4-poster beds. We do not have air conditioning as the house has an open roof and all the rooms have at least one window. Because of this, the Riad is kept cool in the hot summer months and heaters are provided in the cooler months. We have a traditional Moroccan wood burning fire on the ground floor. The property can apply a flexible check-in/out time. No pets allowed at this property.